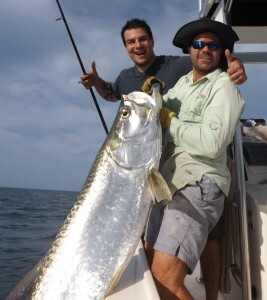 that Tarpon fishing is primarily done sight fishing to mass schools of sometimes thousands of fish make them the king to fisherman looking for a action packed experience. Yes, they are caught many different ways around the world, but nothing equals the large schools that move into Tampa Bay May thru July. before, then maybe you have seen it on TV. When that Tarpon takes the bait, all hell breaks loose. This is called the anticipation factor. When you do set the hook, generally the tarpon heads to the air sometimes leaping higher than 10ft. Battles can last as short as 15 minutes or at times can go 3 hours, though we hate to see any fish strain themselves that long. We try to land them quickly so we can get back to the school and hook another. 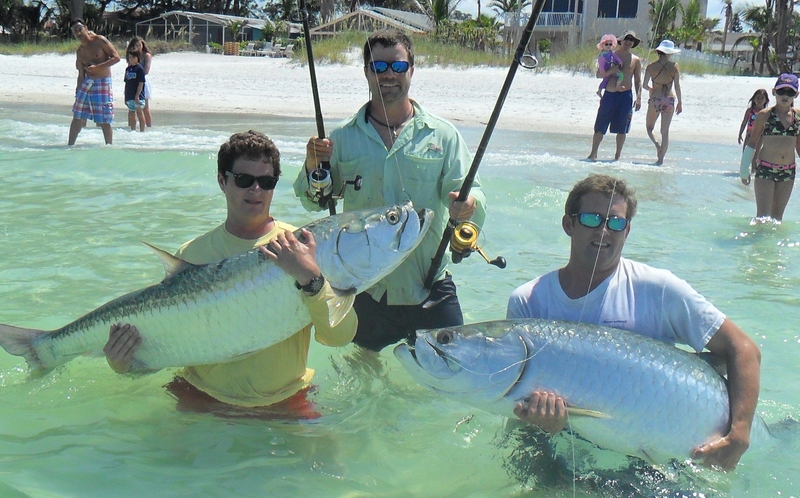 Sometimes a good Tarpon fishing guide can have two to three Tarpon hooked up at one time. Tampa Bay Tarpon fishing is without a shadow of a doubt some of the best in the world. May through July is the very best time of year. A good captain can average 6 to 12 hook ups a day during the peak Tarpon season. 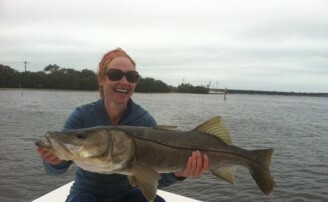 On the best days over 20 fish can be battled on a full day charter. Even on the tough days the sports can plan on doing battle with at least few Silver Kings. is still lots of fish scattered throughout the Bay left over from the migration. September, October and November can be good around Bay area structures. These fall months can also find a migration on the beaches from the fish that came through in the spring and summer heading south for the winter. The fall can be a great time of year to Tarpon fish. The Tarpon are feeding on large schools of bait. The sharks, Kingfish, Mackerel, and False Albacore are mixed in with them making for variety of action. One rod may have Tarpon on it and the next a shark or Kingfish. When comparing Tarpon fishing charters one must do his homework and make sure he has chosen a captain that is extremely knowledgeable of the species. Tarpon are very tactically challenging. Only a captain that spends every day chasing them can produce multiple fish daily. The difference between the great Tarpon fishing guides and the fair ones on a good day could be a 15 fish hook up difference. It’s on the tough days though when the best charter captains shine. The days the wind is blowing, the water is muddy, or the fish aren’t surfacing. These are the days the best still manage three or four Tarpon and the rest go home empty handed. Now when we are talking about a fish that averages 100 pounds, getting to fight four is not a bad days fishing. Going home empty handed is just not fun. Not to say it hasn’t happened to the best but not very often. That’s the difference. 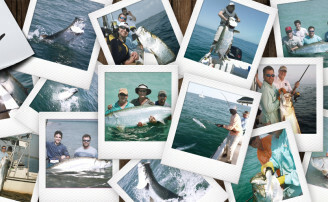 Tarpon charters can vary from half, three quarter or full days. The fish move all day, and the tide and wind direction dictates where the Tarpon will be available for the captain and his clients. Full days are preferable to guarantee success. It is not a sales gimmick; it is just the truth. Sometimes it just takes all day when the fish are being finicky. That being said we have had five fish to the boat before 10am on occasions so generally a half day is fine. The boat is the most important piece of Tarpon fishing tackle. The best captains modify their boats to be Tarpon chasing machine. The most technical boats have large towers so the fish can be spotted as deep 20 ft. This is a must especially on the days the fish are not surfacing. They have large bait wells with 2000 plus gallons of raw water running through them. Tarpon are extremely finicky fish and generally take only the freshest of bait. That being said they will eat dead bait and cut bait at times when on anchor and not under power. The best Tarpon charter boats have very powerful trolling motor systems, up to 8 hp power with enough battery juice to last all day. It is a basic rule of thumb that the captain with the most powerful trolling system can keep up with the moving Tarpon quietly catches the most fish. Fly fishing Tarpon in Tampa Bay can be very good and offers a few unique methods. Fly fishing is most productive sight fishing of the large schools of roaming Tarpon. This is where a very powerful trolling system is a must. 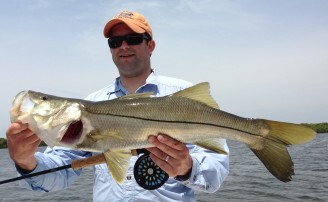 Some fly fishermen prefer the challenge of sight fishing to the smaller schools of Tarpon in 8 ft. of water or less. It is more challenging because the fish are wary. It is exciting to pick out one single fish, make the presentation, then watch him follow your fly and swallow it almost at you feet. To sum it up if you are a professional fisherman, novice, beginner, or have never been fishing in your life, Tarpon fishing is for you. It will be an enjoyable experience you will never forget.